How to get the latest firmware version even if your network operator doesn't want you to get it. Before proceeding I'd like to make a few points clear. By following the indications given here you accept full responsibility for your actions. The author of this document cannot be held responsible for damages caused to your phone in the event that the procedure fails and you're left with a "brick". This procedure worked flawlessly with the handsets I've upgraded but in no way can I guarantee that anyone else will have the same success rate. Note that by proceeding with the upgrade in the manner described hereafter you will void the warranty on your handset and you may lose some operator-specific functions. Please read the whole of this document before proceeding. The idea behind this is to change the product code of your handset in order to obtain newer software for it. So, what is a product code and why does it matter? Some network-specific functions may need particular protocols to be implemented in the handset. This is the case of Orange France, for example. If you browse their mobile site with a vanilla (unbranded) handset, subscriber-specific parts of the site such as finding out your airtime balance or reading your e-mail do not work. Some operators wish to cripple certain functions of the phone in order to protect their revenue streams more aggressively. This is the case, for example, of a couple of UK operators. See here. This means that there is inevitably going to be a delay between the moment when the manufacturer releases a new version of the firmware that can be installed into vanilla handsets and the moment when the network operators have caught up and modified their own versions of the new firmware. For example, at the time of writing this, the latest version of the firmware for T-Mobile's N95 is v14.0.001 while the vanilla version available now is v21.0.016. The product code is the code that identifies the model of the phone, the network that provided it and the region in which it was sold (in order to have the correct languages installed). When using Nokia's Software Update utility (NSU), the program looks at the product code of the phone that's connected and thus knows what the latest firmware version is for that particular model provided by that particular operator in that particular region, and if an update is available, fetches the correct one for the same model/operator/region combination. What we're going to have to do is change the product code of the handset to that of a vanilla handset in the correct region. For this, we're going to have to use a piece of software called Nemesys Service Suite (NSS), and this is the bit that will void your warranty. Your first step is going to be the installation of Nokia's PC-Suite (PCS) in order to perform a backup of the data in your phone because this data will otherwise be wiped when you do the update. The current version as of now is v7. You will also need the Nokia Software Updater to perform the actual update. Next, download and install Nemesis Service Suite. 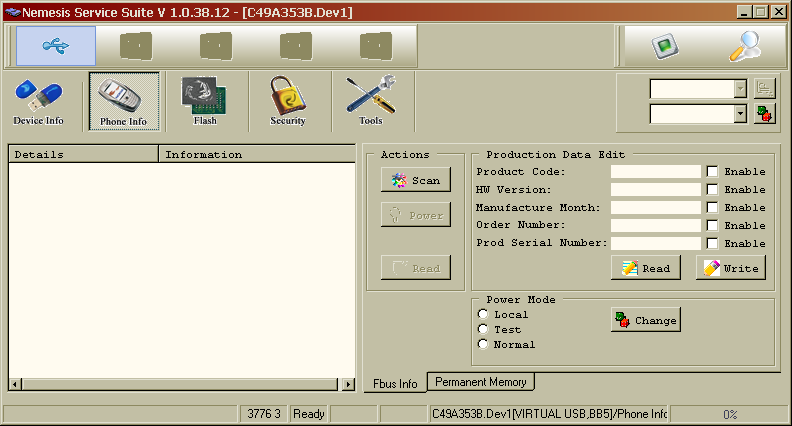 Top-left is a 2D barcode encoding the IMEI number of the handset. Below that it's printed out, and below that there's "Code: 0546659". The "0546659" is the product code. Yours will probably differ. Make a note of it because you're going to put it back when you're done upgrading. Next go to this page, where you will find the product code for the vanilla version of the N95 in your region. For example, if like me you have an N95 plum and you're in the UK (that's EURO1 zone) then the product code you want is 0536062. Enter this code into the "Product code:" text area above, check the "Enable" checkbox just to the right of it (and only that checkbox) and finally click on the "Write" button. There will be no visible effect but the new product code will be written to the phone. You can check this by shutting down and restarting NSS and fetching again the phone info. From now on, your phone will identify itself to NSU as a plain, non-branded handset, and this will instruct NSU to fetch the latest version of the firmware released by Nokia. So, go to Nokia's website and download and install the Nokia Software Updater. Run NSU once it is installed. This will update the phone with the latest version of the firmware and then restart it. The whole procedure will take about 10 minutes plus the download time (a few minutes on a fast broadband connection). Congratulations! You now have an unbranded N95 with all the bells and whistles of the original software and without all the advertising and restrictions imposed by your network operator. Run PCS again and go into the backup area. Then choose to restore a previously made backup and select the backup file you made just now. We just need to clear up a few loose ends before packing up, and even this is optional in fact, but if you want to, you can reinstate the old product code. Simply run NSS again and reprogram the old product code in the phone.